Many homeowners revel in the glory of their garden in spring, only to be disappointed when plants start to dry out and look stressed in the heat of summer. The natural reaction is to pour more water into the garden to “moisturize” the plants. This in turn can lead to root rot and/or the continuous lowering of soil temperature to the point that plants aren’t stimulated to grow – or just plain die (over watering is one of the main causes of plant death). But these problems can be greatly reduced or, in many cases, prevented by summer mulching. The goal of summer mulching is not only to reduce summer heat stress on plants, but to create an environment for plants that will be conducive to good growth. Mulch is to a garden what a roof is to your home. We couldn’t heat or air condition the home without the roof. The same seasonal temperature variance occurs in your garden. A 3″ layer of mulch not only retains moisture in the soil but it maintains a cooler temperature in the summer and a warmer temperature in the winter. Mulching also brings many other benefits to the garden. It gives the garden a tidier appearance, and greatly improves the growing conditions for plants. 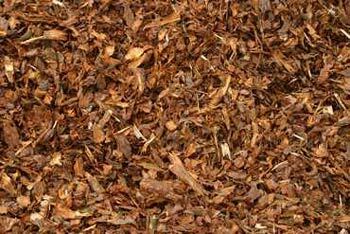 Mulch helps suppress weeds and helps to conserve moisture. It creates an environment where earthworms can thrive and enhance the soil’s condition. Nature provides this for us in natural settings and when we apply mulch to our garden, we mimic what is naturally done on the forest floor. The strategy is to stimulate the growth of good soil bacteria which in turn digest plant foods that the plant will recognize as nutrients and absorb. By keeping moisture in the soil you will attract earthworms and beneficial microbes and bacteria. The earthworms loosen up the soil easing compaction, and the beneficial microbes help digest nutrients more efficiently making them more readily available to the plants. Maintaining “moist” soil as opposed to “wet” soil keeps the temperature of the soil at a more consistent level for optimum growth. Mulch also provides a blanket to the soil that protects against the crusting effect that happens as a result of watering or rain. Organic mulches decompose and add humus to the soil. The method is to spread a 2″ inch layer of mulch or bark over the top of the native soil before the heat of summer hits. There are many mulching materials available. Color, particle size, and nutrient exchange are considerations when choosing your material. While decorative barks are attractive, they can become a home for insects and they will drag nitrogen from your soil. Non-organic decorative mulches (rock and such) may be an attractive addition in gardens but give nothing back to the soil and can also be a hiding place for pests. When mulching is incorporated with a good organic fertilizing program, the plants in your garden will not only survive the stress of summer, but will thrive in it. A good rule of thumb for mulch is to apply it at least 1Â½ inches and up to 3 inches in depth. Mulch should never be placed right up against the stem of the plant or trunk of the tree. In addition to all of the cultural advantages created by mulching, you will also give your garden a more “finished” look, adding to its overall beauty.